Back when I was a graduate student in Seattle, I used to love the (all too rare) clear days when we could get a view of Mt Rainier. 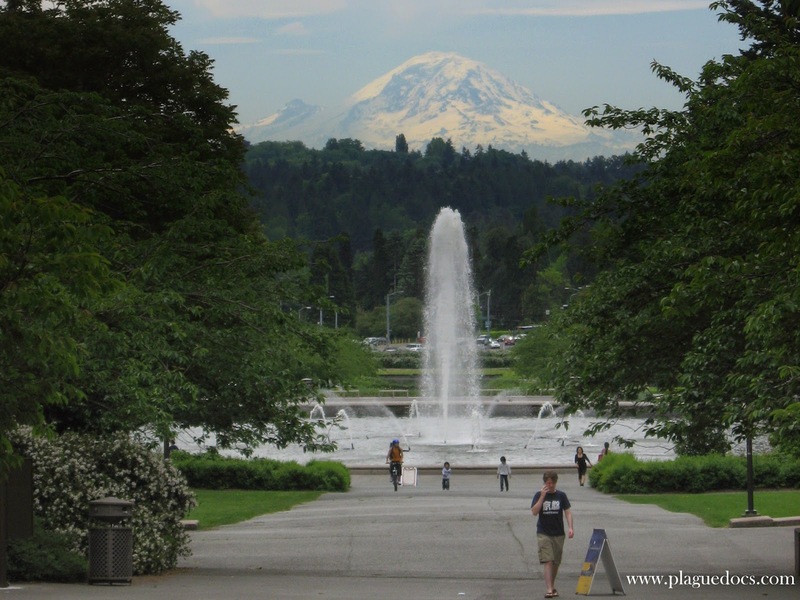 In fact, the U of W campus is built around an avenue sited to feature that very view. But Rainier has a dark side too. I also remember the radio news on Monday mornings announcing the numbers of climbers killed, or injured and rescued, over each weekend. Disliking heights, as well as cold and life-threatening danger, mountains are something I enjoy from a safe distance or in photographs. More recently, but still years ago, we took our then young sons on a visit to the Tech Museum in San Jose. Showing at the museum's IMAX theater was the [then new] National Geographic film, "Everest, Mountain Without Mercy." Climber and filmmaker, David Breashears, had transported a 48-pound IMAX camera (including film -- yes, film) to the top of Mount Everest, capturing footage so beautiful and amazing that I promptly bought the companion book ("Everest, Mountain Without Mercy," by Broughton Coburn) from the museum book shop. The story and images document more than the skillful accomplishment of a difficult movie-making feat, for in May of 1996 a disaster was brewing high above them on the mountain. In fact, the IMAX expedition delayed their own summit attempt to avoid getting caught up in a jam of several large groups just ahead of them. The first bad event they encountered was the death of a Taiwanese climber, who'd been left behind by his group to rest in a tent following a bad fall. He died from internal injuries and the IMAX climbers stopped their own activities to help bring the body part way down the mountain, to where he could be carried on down by the other members of his group on their return trip. On May 10, 23 people from three expeditions reached the summit of Mount Everest, but most of them not until dangerously late in the day. The weather was changing, delays left them low on bottled oxygen, and they faced a difficult climb back down to the relative safety of the highest camp, Camp IV. Only a few made it back to collapse in camp without even realizing how much trouble others were in. A few climbers, including expedition leaders Rob Hall and Scott Fischer, were stranded overnight high near the summit -- too high for any realistic hope of rescue. Others made it down to the vicinity of Camp IV, but were unable to locate the tent village in white-out conditions and a state of complete physical and mental exhaustion. Rescuers had trouble locating a group huddled on the ice, but some were helped to their feet and survival, while others roused to make it to safety under their own steam. Sadly, anyone who couldn't walk couldn't be helped. At that altitude simply staying alive and mobile is so difficult that it helping an incapacitated fellow-climber is effectively impossible. Elite climbers are a small tribe, and some of those trapped on the mountain were not only known to members of the IMAX team, but were personal friends. Guide Rob Hall had stayed not far below the summit to try to help one of his clients. The client, Doug Hansen, didn't survive the night, but Rob Hall was in contact by radio with his friends lower down the mountain who were unable to do more than beg him to get moving. They even patched through a radio call to his pregnant wife at home in New Zealand. Tragically, he was unable to coordinate a climb back down, and no one was able to reach him. Much closer to Camp IV, client climber Beck Weathers had been unresponsive and left for dead. Somehow, he managed to rouse himself and walk into camp. Badly frostbitten and suffering from extreme exposure, he defied all expectations of his imminent death and was helped all the way down to Camp II. There, a miraculous helicopter evacuation succeeded in transporting him for emergency treatment. In total, five climbers died on the Nepalese side of Everest that day, while three Indian climbers approaching Everest's summit from the North side of the mountain also lost their lives. Remarkably, after all that had happened, the IMAX team rested in base camp, and when weather conditions improved headed back up the mountain to make their own successful summit push on May 23rd. Aside from the IMAX team's record of the events on May 10, the story has been told in book form by several of survivors. In particular, adventure journalist Jon Krakauer was on assignment for "Outside Magazine" as a client climber in Rob Hall's group. Krakauer's book, "Into Thin Air" is a gripping read based on his personal experiences and observations, as well as interviews with other survivors. A skilled technical climber who lacked previous high-altitude experience, he writes vividly about the his own hypoxia-induced impaired judgement and even hallucinations. While "Into Thin Air" doesn't really assign blame for the disaster, Krakauer does try to work out contributing factors, which if avoided might have led to a better outcome. While he doesn't spare himself from responsibility, he is hardest on the team leaders (neither of whom survived to explain their decisions) and guide Anatoli Boukreev. A Russian climber of great expertise working for Scott Fischer, Boukreev has been criticized for guiding the summit without using bottled oxygen -- which meant he had to descend rapidly, leaving clients higher on the mountain to make their way down without him. Likely feeling slighted by Krakauer's account, Boukreev wrote "The Climb: Tragic Ambitions on Everest." While not as well written or as sweeping of an account as "Into Thin Air," it is interesting to understand Boukreev's theories about climbing and guiding, which were somewhat different from the other writers. He also fairly reminds readers that because he'd had a chance to descend and recover at Camp IV, he was able to go back out into the storm on repeated rescue excursions -- indeed he saved the lives of several clients, and made a heroic attempt to rescue Scott Fischer. Survivor Beck Weathers also has a book, "Left for Dead: My Journey Home From Everest." There is inspiration to be found in his personal story of survival, and in fact I believe Weathers left medicine to pursue a career in motivational speaking. He lost both hands and his nose to frostbite, and submitted to numerous surgeries as well as lengthy physical therapy. Of all the deaths and disasters of climbers attempting the summit of Everest, the events of May 1996 are still the most often told and retold and remembered. An opera is premiering in 2015, and a new film is scheduled to come out this year also. The film, "Everest," features Jake Gyllenhaal and Josh Brolin as well as Keira Knightly and Robin Wright. I think the incident continues to resonate with strength of a Greek tragedy or a Shakespeare play due to the expert narratives provided by the IMAX team and Jon Krakauer. Tales of adventure, accomplishment, hubris, and fate never get old or dull.